Have you ever visited a business and noticed a glaring fault or weakness in the customer experience? In these instances I often wonder how management can find this acceptable and why they don’t simply fix the problem and reap the financial benefits of improving the customer experience. It’s not that easy though. Seeing your own business from the outside in is challenging. Often, business owners, managers and employees are consumed with day-to-day operations and don’t notice these pitfalls. The same is true for your practice. This blind spot is part of our human nature, and it makes providing a stellar patient experience difficult unless you have a little help from the people who are in the best position to judge each interaction: your patients. Your patients are a valuable resource for evaluating the health of your practice. They can provide a goldmine of data. When extracted and applied properly, that data can help you make smart, informed practice decisions – or awaken you to small irritants invisible to you and the members of your staff. Some of the most attractive reasons tapping into patient feedback makes sense are the affordability, ability to re-measure as frequently as you want, and the ability to ask patients about specific topics, like a location move, the addition of a new service, or extended hours. Keep it anonymous. Patients don’t want to give negative feedback to a practice or provider they ‘like’, nor do they want to be viewed as complainers. Use an online survey provider, your practice management system’s portal, a mail-back postcard or an in-practice form that patient’s seal in a blank envelope, or drop into a box. Don’t ask too many questions. Focus your survey on a specific topic such as customer service issues or a proposed change or addition. Ask just a handful of questions or less and always provide space for comments. Keeping it short and sweet will encourage participation, be less likely to irritate patients and garner more honest feedback. Force an opinion. Provide an even number of choices, such as two positive and two negative. In other words, if you want to have information you can take action on - avoid a neutral response option. Encourage patients to be honest. Express to patients how valuable you feel their opinion is and that your practice is looking for ways to improve. Underscore this by letting them know when you intend to respond to their suggestions and when you do have the results – let them know the action you’re taking. Asking for feedback and ignoring it can be more harmful than not asking at all. Patient feedback is a valuable tool to gain insight and creative suggestions directly from your patients. Not only does this insight empower you to make data-driven change, it can also help you avoid costly mistakes. 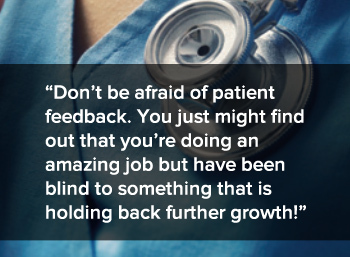 Patient feedback can also provide practice leaders with the opportunity to acknowledge high performing staff, as well as opportunities for new or more training. Don’t be afraid of what you’ll hear - implement a patient survey tool today! You just might find out that you’re doing an amazing job but have been blind to something that is holding back further growth and success of your practice! One of the most popular online survey tools, Survey Monkey offers a HIPPA compliant healthcare survey center, with flexible question options – allowing you to develop surveys that are as unique as your practice. While the HIPPA compliant features are part of a paid subscription, general survey features are available for free. You can’t mention patient satisfaction surveys without Press Ganey. While Press Ganey offers standardized surveying for (typically) large health care organizations, they also have a variety of content available to help inspire your surveys and measurement. Make it obvious that you want patient feedback by adding a section on your website for patients to submit feedback directly through your website. See examples, such as Dr. Tara Peyman and Well Life Medical.